Find out what a VPN for business is, what to look for when selecting a brand, and why you really need one for your business today. VPNs are used for many recreational reasons, but businesses are beginning to understand their benefits as well. A VPN for business is the same thing as a regular VPN and provides security, convenience, and accessibility to those who are connected. For those who aren’t aware, a VPN is a virtual private network. It creates a private connection between users so that you can connect remotely and share information securely. If you’ve looked into VPNs already, you’ve undoubtedly heard of ExpressVPN. Some would view this as the unrivaled champion of the industry, and ExpressVPN is pretty hard to beat. It has servers in more than 100 countries, an astounding 1,500 servers, and 30-day money back guarantee. What’s even more appealing for businesses is the speed test results. ExpressVPN ranks quite high on speed tests, which means that you won’t ever be left waiting for pages to load, files to transfer, or messages to send. Security is also strong with this company. ExpressVPN has its own DNS, so you can forget about leaks, a built-in kill switch in case your VPN ever goes down, and good encryption. Top it all off with great 24/7 customer service, and it's easy to see why so many people rate ExpressVPN as number one. The downside to this company is that it’s pricey, but you get what you pay for. If security is important to your business (and it should be), NordVPN is a good choice. It offers superior quality encryption to secure all of your network activity, and it accepts bitcoin payments. There's also a built-in kill switch and DNS leak protection. Based in Panama, NordVPN also has no one to answer to, your activity isn’t logged, and nothing needs to be handed over to authorities. Plus, with NordVPN, you can connect as many as 6 devices simultaneously, making it a good option for multiple team members or locations. This service is also liked for its frequent upgrades (automatic and for free), so you get faster connections and more servers all the time. Don’t forget the 2,600 servers available to date. Finally, NordVPN is one of the most affordable options on the market. The mobile app could use a cleanup, though this shouldn’t be a deal breaker. CyberGhost draws people in with its friendly mascot, but it keeps customers coming back with its reliable service. This VPN is a good choice for businesses because of the top security features, wide array of protocols supported, and fast speeds. CyberGhost has 256-bit encryption, a kill switch, and DNS and IP leak protection included. This company supports OpenVPN, PPTP, and L2TP/IPsec, and an array of configurations. CyberGhost is also great for getting around geo-restrictions from all over the world. With some of the lowest rates, this is an excellent option for small and medium-size businesses looking to save. You won't have much success unblocking Netflix, but you shouldn't really be doing that during work time anyway. PureVPN has been around since 2006, and it offers a lot to the average business user. For one thing, you get an app with your account that includes all the features you could want on a mobile device. Additionally, some of PureVPN’s servers are super-fast, and since they cover a wide spectrum, you’ll easily find a server for your purposes. What is more impressive is the way PureVPN organizes its service. You can select servers based on your needs (streaming, privacy, speed, etc.) so you get the best server for the task at hand. PureVPN does need to work on speed consistency though, in order to really compete with the top players. PrivateVPN is not as well known in the industry, but it should be because it provides great service for businesses. Like NordVPN, PrivateVPN offers excellent privacy to anyone who wants to keep their business their business and no one else's. It has a no logs policy—and PrivateVPN actually sticks to this—2048-bit encryption, and a solid kill switch and leak protection built-in. Customers will also appreciate the 30-day money-back guarantee, which gives you a month to test drive the service and cancel if you are not completely happy. PrivateVPN does have fewer servers than most companies, which could be a problem for heavy workloads. 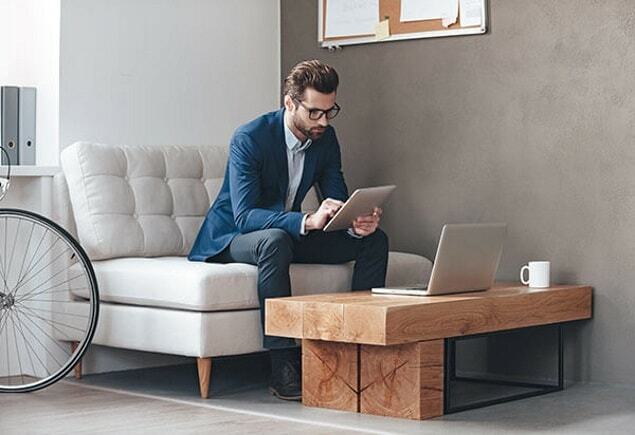 With telecommuting and out-of-office work hours on the rise, a VPN allows employees to connect to the company’s private network from anywhere, and at any time. While most systems will allow you to connect regardless of what type of connection you use, the added benefit of a VPN is that your connection remains secure. This means important and sensitive documents and information being shared, viewed, and sent over the network will remain secure and hidden. A secure VPN lets employees get in some after-hours work without compromising security. This also helps employees continue their work schedule even while traveling. If you’re out on a business lunch, trying to get in a few last minute emails at the airport, or getting work done while connecting to a public WiFi network for any other reason, a VPN keeps these communications encrypted and secure as well. This includes browsing activity as well as information that is physically present on your computer or mobile device. If you're in an industry that requires you to access geo-blocked sites or material, a VPN is a good workaround. Journalists, for example, can connect to blocked websites that are being censored or restricted to or from a certain location. If you have multiple branches or offices in various locations, a VPN is an easy way to connect teams, branches, or team members. The VPN provides a secure channel for sharing documents and information while making collaboration easier for everyone. The more and the closer the server is to you, the faster and better the VPN service you’ll get. So, a company that offers server locations close to you should weigh more heavily in your comparison than one that does not. This is also important if you are specifically trying to give the impression that your business is in a particular geographic location. For example, if your customer service team is located in Singapore, but you want your customers to believe they are in the US, you'll need a VPN that has American servers to provide that type of IP address. Also, if you are trying to unlock a geo-restriction, make sure that service has servers in the location that is not blocked. If you are downloading or transferring large files, you’ll need as much bandwidth as you can get. A site that limits your bandwidth will stall your progress, something that many businesses can’t afford (and shouldn’t accept from a VPN service). As with bandwidth, speed is essential for fast and smooth business communications. Check with the service provider prior to signing up to see what their average daily speeds are and if any limits apply. Since you’re doing business over the network, you’re likely sending and receiving sensitive information all the time. Because of this, you need to find a VPN that provides maximum security. This may include secure privacy policies like no activity logging, firewalls, and encryption. Of course, not all businesses have the same needs. Small businesses that only do a nominal amount of network communication will only need a limited amount of bandwidth. If your business only has one location and does a smaller number of transactions, you probably don’t want to pay for a more robust service and all the frills. Alternatively, a larger business that does a heavy amount of business will need more bandwidth and speed to accommodate the workload. Larger businesses may also want to invest in better security features. Running a business today has many challenges, but using a VPN for business can alleviate a lot of them. Offering security, convenience, and enhanced communication, a VPN is the best way to keep your business running securely and without interruptions. Check out these reliable VPN providers today.